It’s the week of Shavuos! Things have been a bit crazy in the Klempner household as of late. We’re already in the week of the Jewish holiday of Shavuos, the subject of my picture book, A Dozen Daisies for Raizy. I love using the book every Shavuos with my K-2 library groups, and was delighted that several of the 1st and 2nd grade girls said that they also own the book. This year we talked about what the daisies meant to the recipient and decided that they meant “I like you” or “I care about you”. The second graders were able to say that the flowers were a reminder of Raizy’s invitation or offer of help. This year I gave the girls the attached pages to fill in during check out time–one even suggested that you could send them to Hashem, but another was sure that Hashem can make His own flowers. Here’s a copy of the handout she used. Feel free to borrow it, but give credit to Davida, okay? I worked a few years ago in a playgroup and it was one of the kiddies’ favorite and the only ‘long’ one I could sit through! Another fan of Raizy, Chani Fischman, wrote me to say:[m]y daughter has brought your book, A Dozen Daisies for Raizy, home from her school library a few times and we’ve enjoyed reading it together at bedtime. I like the fact that 1. The book is not too wordy (I hate wordy children’s books) 2. The pictures are vivid. 3. Subtraction becomes so clear to children without them realizing that they are actually doing a mathematical operation. Recycled kid’s project for Shavuos. I haven’t been blogging much lately because I’ve been working on several larger writing projects. I’m very excited about them, but I can’t talk about them yet! 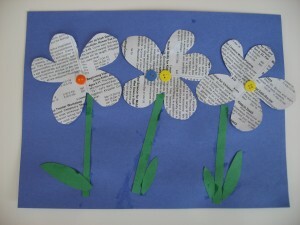 However, I thought readers would appreciate the links to art projects that can be used to teach about Shavuot to kids 3-7 who might be reading A Dozen Daisies for Raizy this week in preparation for the holiday.